I tried searching my blog for this recipe but couldn't find it so decided it must be time for a repeat. I can't imagine that I wouldn't have shared this recipe as it is a staple at our house. This recipe was originally designed for a bread machine so directions say to “add all ingredients in order suggested by your bread machine manual an process on the basic bread cycle according to the manufacturer's directions.” I have made several changes to the original recipe (surprise!) but it will still work GREAT in a bread machine. If you grind your own wheat to make flour, don't use the bread machine as the bread will raise too much and fall before it starts baking. I mix my ingredients in a Bosche bread mixer for 10 minutes. Then place in bowl, cover and let rise till double. Punch down and let rise a second time. Punch down, them make into loaf, put in loaf pan (I use Pampered Chef stoneware loaf pan) and let rise till double (approximately 30 minutes). Place in 350 degree oven for 50 minutes. Let cool on cooling rack covered with a cloth or towel. For a softer crust, run loaf under cold water after removing from oven and loaf pan. NOTE: In place of sugar, I have used applesauce, honey, mashed potatoes and squash. You will need to adjust the water to flour ration if using wet items. With my bread mixer, I just add flour till dough pulls away from the bowl so it's easy. 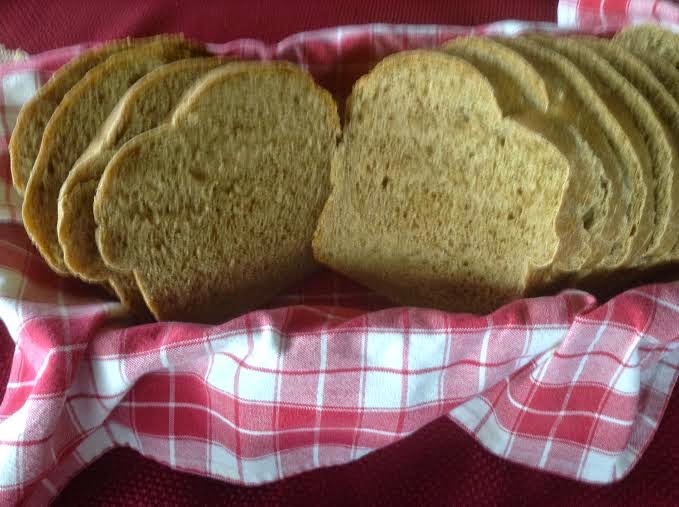 I hope you get a chance to try this bread as it is delish! In the summer when I take a break from baking bread because I don't want to heat up the house with oven, my family starts yammering for homemade bread in less than a month! Tasty indeed. Whole wheat's my preference for bread.